The 2017 Toyota TRD Pro is Toyota’s answer to the ever-increasing demand for off-road capability. The 2017 Tacoma TRD off-road trim with additional hardware, the Pro, is a four door 4×4 that is only available in a short-bed double cab arrangement designed for the outdoors. Its appeal comes from the fact that is the complete package while maintaining its unique style. Available in Barcelona Red Metallic, Alpine White or Cement Grey Exterior and many more colours. Come see everything the 2017 Toyota TRD Pro has to offer today at Sherwood Toyota. The Tacoma TRD Pro comes with a 3.5L V6 engine which pushes 278 horsepower and 265 ft.-lb. of torque. This engine is married to a six speed automatic or manual transmission. 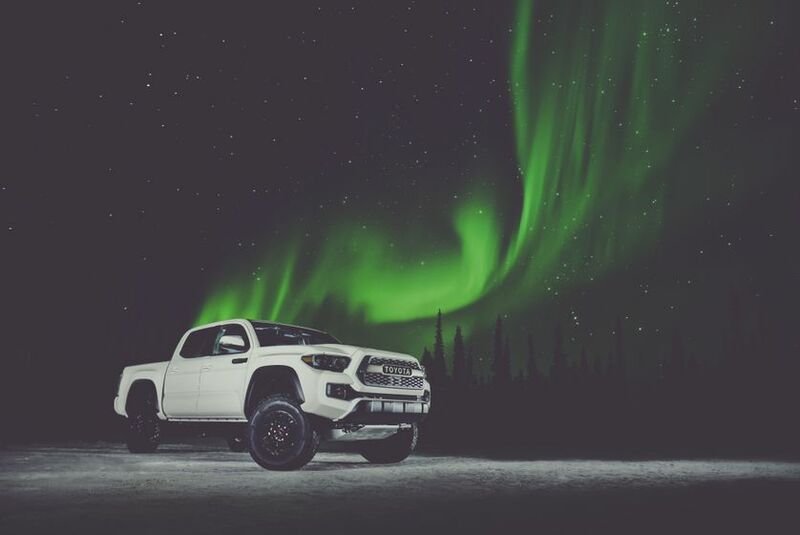 The 2017 Toyota Tacoma TRD Pro is one of the few trucks that has incredible off-road capabilities and can be combined with a manual transmission. The suspension includes a TRD-tuned Fox front and rear internal-bypass shocks (2.5 inches), while TRD front springs give a 1-inch lift. This allows clearance while tracking off-road and ensures the truck can climb when it needs to. Progressive-rate rear leaf springs and the remote reservoir suspension kit further add to the off-road clearance and climbing abilities. A mandrel-bent, stainless steel cat-back exhaust helps to maximize performance and efficiency. This system also adds bark to the Tacoma TRD Pro’s bite with a low growl. The 2017 Toyota Tacoma TRD Pro is one of the best in its class when it comes to safety. The Toyota STAR® safety system is standard on every Toyota. Vehicle Stability Control (VSC) helps avoid wheel slip and loss of traction by adjusting the engine’s power distribution and applying brake power where needed. The Traction Control System reads ABS information and senses when one wheel is spinning faster than others, and again limits engine power distribution in this situation. Brake Assist detects panicked or last minute forceful braking to help the driver bring the car to a full stop safely. 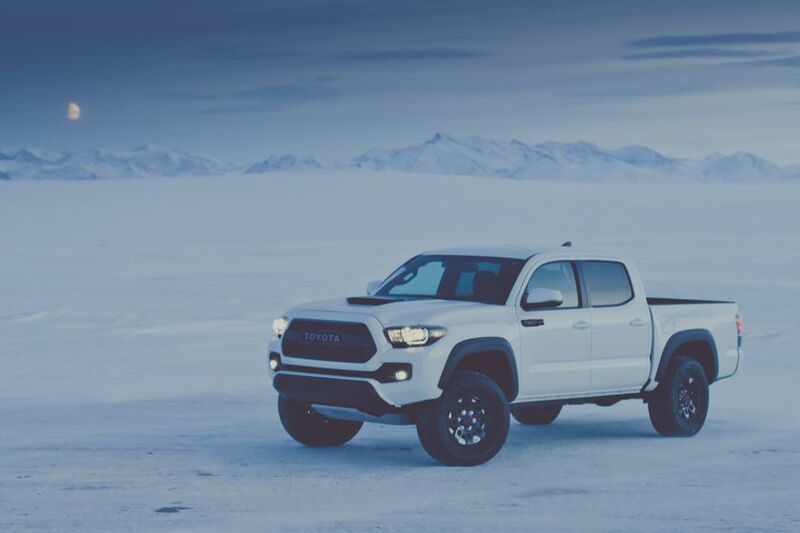 Other options that help keep the Tacoma and its occupants safe are standard Anti-lock Brake System, Electronic Brake-force Distribution, and Smart Stop Technology. The 2017 Toyota Tacoma TRD Pro has an aggressive and highly stylized exterior. It includes a blacked-out hood scoop, the trademark TOYOTA heritage grill, projector-beam headlights housed in black bezels, and below them sit Rigid Industries LED foglights. The black overfenders sit atop 17-inch TRD black alloy rims wrapped in Goodyear Wrangler® All-Terrain Kevlar® reinforced tires. Inside the 2017 Toyota Tacoma Pro are heated, leather-wrapped front seats with embroidered headrests. 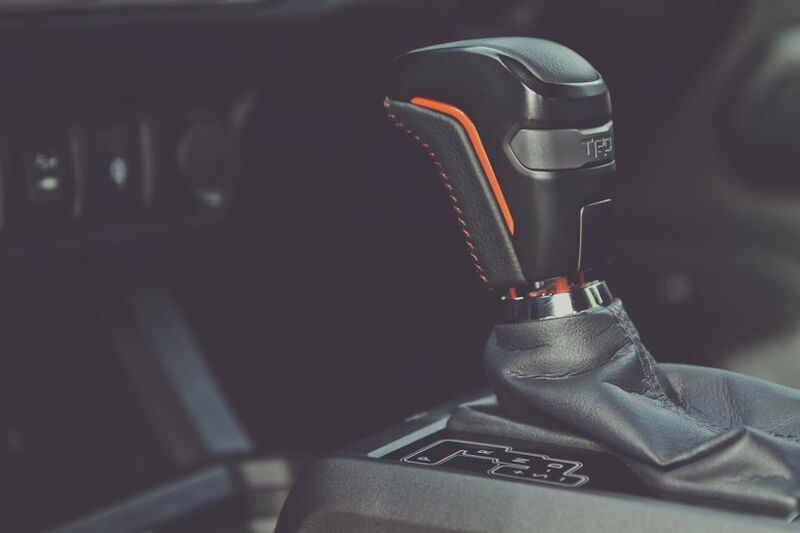 A TRD-branded shifter knob and floor mats are sleek and stylish while the TRD badges throughout the vehicle add to the overall aesthetic. In the dash a 4.2-inch full-colour Multi-Information Display displays an inclinometer with roll/pitch to help keep the driver informed at all times. 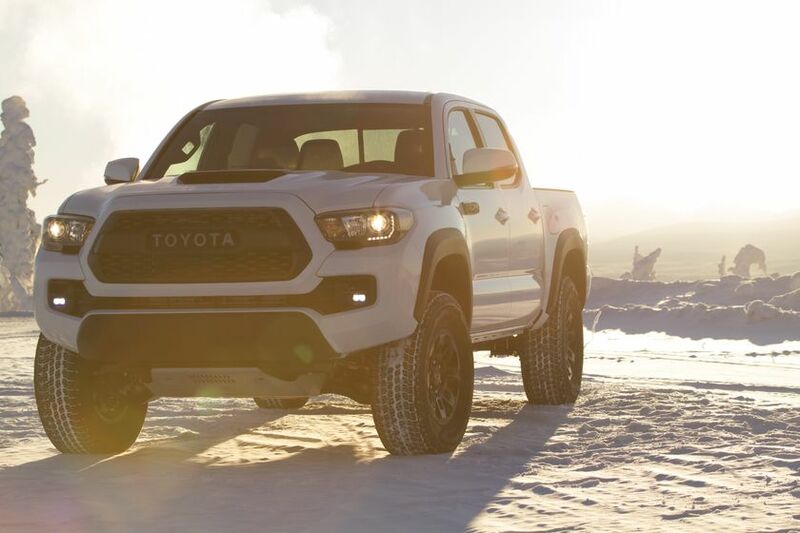 The 2017 Toyota Tacoma TRD Pro comes equipped with a host of technological advances. Multi-terrain select allows the driver a choice between different drive systems, which are custom-tailored to the outdoor conditions. 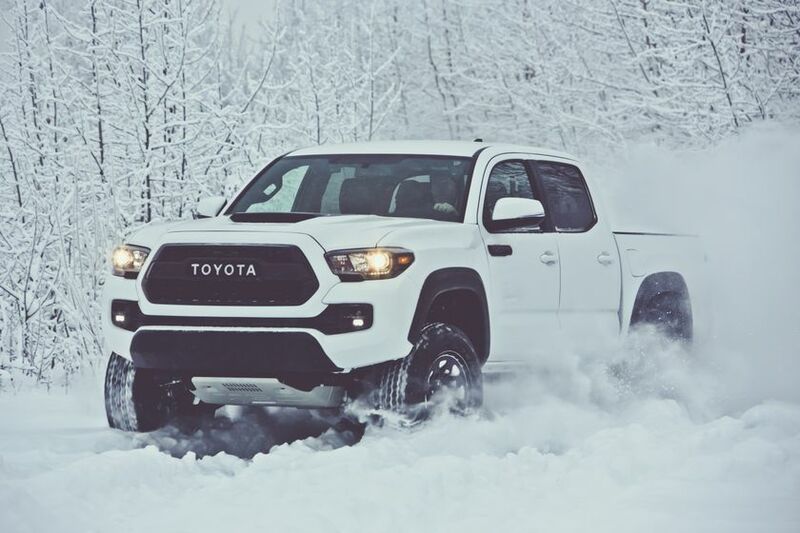 Crawl Control and Hill Start Assist help the Tacoma handle any type of challenge terrain with ease. The electronically locking rear differential puts power where it needs to go to ensure the truck can handle rain, snow, mud, rocks, tough climbs, and anything in-between. Inside the truck there is a 4.2-inch colour multi-information display and a stylized steering wheel which includes controls for the audio and cruise control functionality. For 2017, the Toyota Tacoma TRD Pro is the obvious choice for those who love to hit the dirt. Featuring exterior style, interior comfort, safety features in droves, and unmatched off-road capability, this truck is for the driver that wants it all. Great for a drive to the grocery store with the intent of turning heads, or hitting the back trails for some fun, the Tacoma TRD Pro can handle it all with ease and look good doing it. Come see the 2017 Toyota TRD Pro at Sherwood Toyota and take one for a test drive today. We are located at 31 Automall Rd, Sherwood Park, Alberta or call our expert Sales Staff (780) 410-2455 with any inquiries.